Everyone knows the name Ian Fleming. It is not, by any means, a new name to the 20th century reading public and almost all could tell you that the great Ian Fleming was the creator of the dashing James Bond and all his escapades. However, all may not know Ian Fleming was not only the author of the Bond novels, but also an English journalist and naval intelligence officer. But he is primarily remembered as an author, who sold thirty million books during his lifetime, with double that sold in just the two years following his death. Made into films, by 2012 the Bond series movies were the second highest grossing film series of all time, trailing only behind Harry Potter. 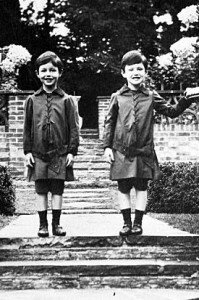 Peter and Ian as youngsters – so close that it is hard to tell them apart! We know Ian Fleming was one of five children, grandchild of Robert Fleming (a wealthy merchant banker, founder of Robert Fleming & Co.). But what is known about Ian’s older brother Peter Fleming? Many today may not know or remember this name, but in his time Peter Fleming too rocked the literary world, just as his younger brother would a decade or so later. Peter Fleming, born in May 1907, was an adventurer, a travel writer, and a heartthrob throughout the 1930s and 40s. How then did this popular, adventurous author become overshadowed by his younger brother to the point where almost ten years after James Bonds’ author Ian died young, Peter’s modest gravestone in a quiet town in the Oxfordshire countryside read, “He travelled widely in far places; Wrote, and was widely read. Soldiered, saw some of danger’s faces, Came home to Nettlebed. The squire lies here, his journeys ended – Dust, and a name on a stone – Content, amid the lands he tended, to keep this rendezvous alone.” How one goes from stardom to a modest, quiet life is a very good question indeed! Our 1st edition listing of Peter’s first book. Peter and Ian Fleming grew up one year apart, from a well-to-do family, in the United Kingdom. Though it must have been difficult growing up so close in age as sibling rivalries took place, the brothers seemed not to let it get in the way of their relationship and throughout their lives were steady supporters of each others’ careers. Both were trained in intelligence during the course of World War II, both were star pupils at Eton (though where Peter seemed to glide through, Ian was a more difficult case). This, unfortunately, seemed a usual ritual. Ian struggled to make a living as a stockbroker, while a 24 year old Peter was working as the assistant literary editor at The Spectator. Peter answered an advertisement looking for a adventurous soul for an expedition through Brazil, and began his travel writing career. 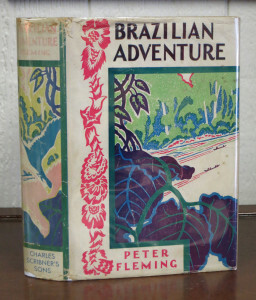 The resulting book, Brazilian Adventure, launched the elder Fleming’s literary career. He married the beautiful film actress Celia Johnson, and for a while his fame was more intense and well-known than Ian ever dreamed he could experience. Unfortunately, in 1947, Peter fell from a horse and suffered a crushed pelvis. After this incident he wrote no more travel books in far-off places, and retired to a somewhat more modest and quiet life. Goldfinger – one of Ian Fleming’s most beloved stories. Our holding signed by Bond movie stars! Peter was the instigating force behind the publication of Ian’s first novel, Casino Royale. It was Peter who suggested the change of M’s secretary to Moneypenny. Peter went over Ian’s manuscripts with such a fine-toothed comb that it “earned him the nickname Dr. Nitpick” (Telegraph.co.uk). So why then – if Peter was the accomplished literary scholar, the responsible adventuror, the charming author – is it more his younger brother we remember today? Ian Fleming wrote Casino Royale in 1952, and finished the novel within a short span of a couple months. The resulting story was immediately popular and three print runs were necessary to cope with the large demands made for the book at its publication. Casino Royale introduced the character of James Bond, a handsome and charming MI6 Secret Intelligence Officer, known by his code name “007.” The Bond stories center around this daring spy’s exploits, often involving ruthless villains and pretty women. Ian Fleming enjoyed a decade of immense success following the quick publication of his first five Bond novels, a period which went into a short decline after his popularity suffered a blow under a harsh criticism of his book Dr. No. However, it bounced back once knowledge that his novel From Russia, With Love was hailed as one of John F. Kennedy’s favorite books of all time. At this time Fleming began work on the screenplay of Thunderball, Goldfinger, Dr. No and From Russia, With Love, while also taking the time to publish a beautiful children’s story, Chitty-Chitty-Bang-Bang. Unfortunately for Ian, his life was cut short. A life-long drinker and smoker, Ian suffered a fatal heart attack on August 12th, 1964 and passed away on his son Caspar’s 12th birthday. For the years remaining to him, Peter struggled to be a father-figure to the troubled Caspar (who committed suicide at the age of 23), but Peter also succumbed to a heart attack 7 years later, while out shooting with friends. Hunting game was one of Peter’s greatest joys in life, and a primary he pursued the Brazilian adventure mentioned earlier. It seems only appropriate that he would die doing something he loved. What then, of the intense similarities and differences between these two brothers? Both magnificently talented, if not in similar writing styles, but more their ability to make a splash. Both dependent on the other for support and friendship throughout their lives. On one hand you could make the argument that it is unfair for so much literary popularity to reside in one family. On the other… how lucky we are to have experienced both of their styles and careers from their literary remains! 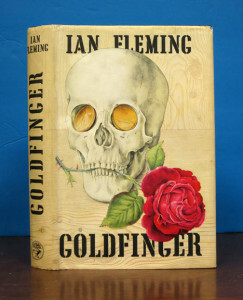 This entry was posted in Antiquarian Books, Collecting, History, Uncategorized and tagged 007, Fleming, James Bond on July 8, 2015 by tavistock_books.